Actress Alyssa Milano takes to Twitter in defense of breastfeeding moms everywhere after her supply of breast milk is confiscated at London's Heathrow Airport. There's no use in crying over spilled milk, but what if someone threw away your hard-pumped breast milk before a nine-hour flight to somewhere far away from your babe? 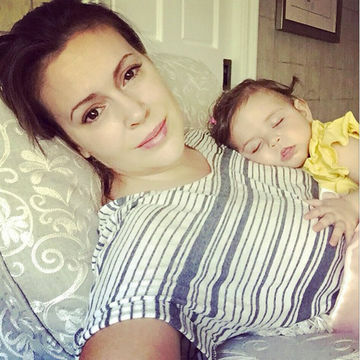 That's what happened to actress and mom-of-two, Alyssa Milano, and while she's not crying, she is causing a (rightful) uproar. I'm about to go away with my husband for a romantic getaway. Without the kids. Terrified. She continued to say that while they tested her toiletries, they just threw her breast milk in the trash. We're with Milano when she asks why shampoo is fine, but breast milk isn't. "I would have happily spread milk in different containers (which I travel with) to comply to those liquid rules. Instead, milk was taken away with no discussion. Shampoo, lotions, et cetera, were simply tested and handed back with no issue. Makes no sense at all." Even though information on Heathrow's website confirms the rule, if Milano had been traveling domestically here in the U.S., it thankfully wouldn't have been an issue. According to the United States Department of Homeland Security's TSA website, "travelers with or without a child may bring medically necessary liquids, such as formula, breast milk and juice, in quantities greater than 3.4 ounces in their carry-on baggage. The formula, breast milk and juice need not fit within a quart-sized bag." Any mom who's ever pumped breast milk—whether in the comfort of her own home, a nursing room or a cramped bathroom stall—understands Milano's annoyance. It's work to get that precious liquid! And while complying with security measures is obviously important to keep everyone safe, breast milk is not just any liquid, it's necessary nourishment for growing babies—grownups don't get their lunches taken away! As Milano said in a statement to People: "Every ounce of milk I'm able to produce for my child is nothing short of a miracle and to watch that milk be thrown away without any regard for my baby, was heartbreaking. It's not the fault of the security in the airport; they're following orders to keep us all safe. But I do feel it is a policy that needs thoughtful reconsideration. I'm glad this has started a dialogue. My only hope is make things easier for moms, breastfeeding and formula-feeding moms, everywhere."